I would admit that I’m not a fan of panna cottas. And let’s just say “not a fan” is putting it mildly. It’s the dessert that I most often gloss over in any dessert menu. I did have that one panna cotta that left a deep impression. It was part of the degustation menu at Aria in Sydney that I had probably five years ago. When I read “panna cotta” on that menu, I was frankly disappointed and I remember thinking, couldn’t have Chef Matt Moran come up with something more exciting? It ended up as the best panna cotta I ever had; it was a memorable vanilla panna cotta with strawberry jelly that my best friend I still reminisce about fondly till this day. Sure, it was safe in terms of flavours – strawberry and vanilla but it was what I desired after a heavy and rich meal. 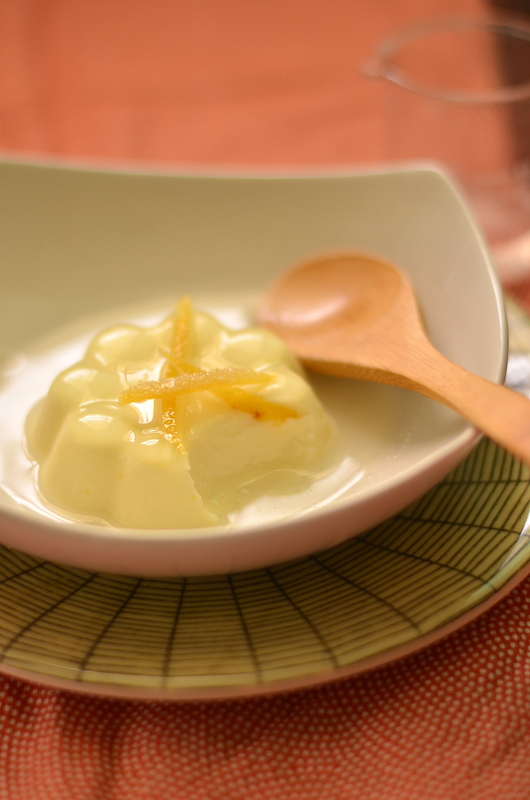 Since I had some fresh yuzu fruit left, I thought that maybe I should make a yuzu panna cotta. In my mind, the delicate and refreshing flavour and its light texture would make a good dessert. The problem I faced was trying to decide on the “sauce” to go with this yuzu panna cotta. I thought a berry compote would detract the flavour of the yuzu; I experimented with a lemon caramel sauce but tossed that out because the citrus caramel while nice, overpowered this delicate yuzu flavour in the panna cotta. In the end, I went with a simple yuzu simple syrup and gave it some candied lemon peel as garnish. The flavour of this panna cotta is simply perfect – delicate and light and the texture of it is how panna cotta should be – creamy and smooth; it gives a slight wobble as you give the plate a light shake. If you are pressed for time and still want to make dessert for a dinner, a panna cotta is probably the answer. It is easy and quick to put together, can be made in advance (overnight) and with light flavours would make the perfect ending to a heavy meal. I think that I’m slowly but surely changing my opinion of panna cotta…as long as it wobbles. I used a few small stainless steel jelly moulds for this and only half-filled these moulds as I prefer having a small portion of panna cotta. You don’t have to oil it as the panna cotta comes out easily when you dipped the moulds in hot water for a few seconds. You can even serve these in little shot glasses if you don’t wish to unmould the panna cotta. 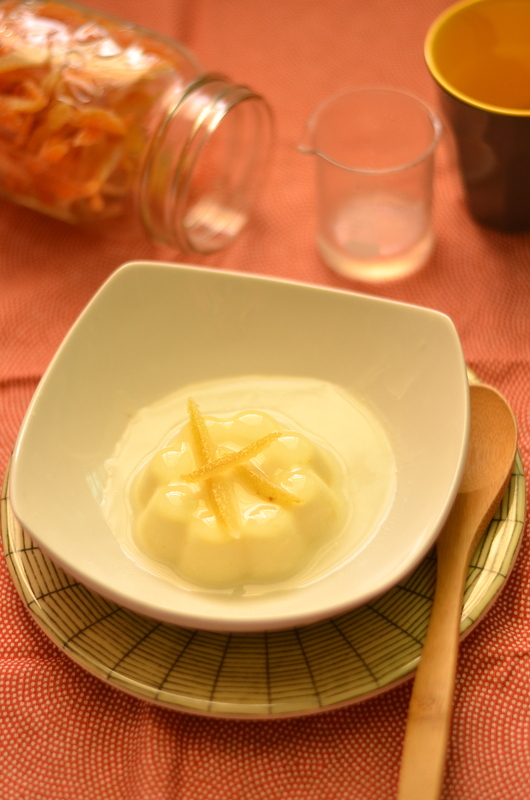 If you cannot find yuzu, you can make a citrus panna cotta with any other citrus fruits. Lemon would be perfect! I serve these with some homemade candied citrus peels – refer to my recipe here. 1. Place cream, milk into a pot and heat it up until it is warm to touch. Place yuzu zest to allow to infuse for about 30 mins. 2. Soak the gelatine leaves in a bowl with cold water (I use room temperature water with a few ice cubes) and set aside. 3. Add in sugar to the above pot and bring to a boil. When cream comes to a boil, add in the juice of the lemon and yuzu and stir until combined. Simmer for a few minutes. 4. Remove the gelatine from the water and squeeze off any excess water. Stir it into the hot cream mixture. Let the mixture cool down completely, give it a good whisk, before straining it into a jug (removing the yuzu peel). 5. Pour the mixture into the moulds (about 85ml per mould) and refrigerate for at least 5 hrs (until completely set) or overnight. 6. To remove the panna cotta from the moulds, dip the moulds into hot water for a few seconds and then turn it out on your serving dish. Alternatively, you can make a simple lemon syrup. Use the juice of half a lemon. Because a yuzu fruit yields less juice than a lemon. 1. Place sugar and water, zest of half a yuzu, and heat until it comes to a boil, until the sugar has dissolved completely. Squeeze in the juice of half a yuzu. Taste and add more yuzu juice, to taste. 1. Spoon the yuzu syrup over the yuzu panna cotta and topped with some candied citrus peel. This entry was posted in Baking, Desserts, Plated desserts and tagged citrus, panna cotta, plated dessert, yuzu. Bookmark the permalink. Fabulous! Yea! Another Yuzu recipe! Sounds delish! Thank you so much! 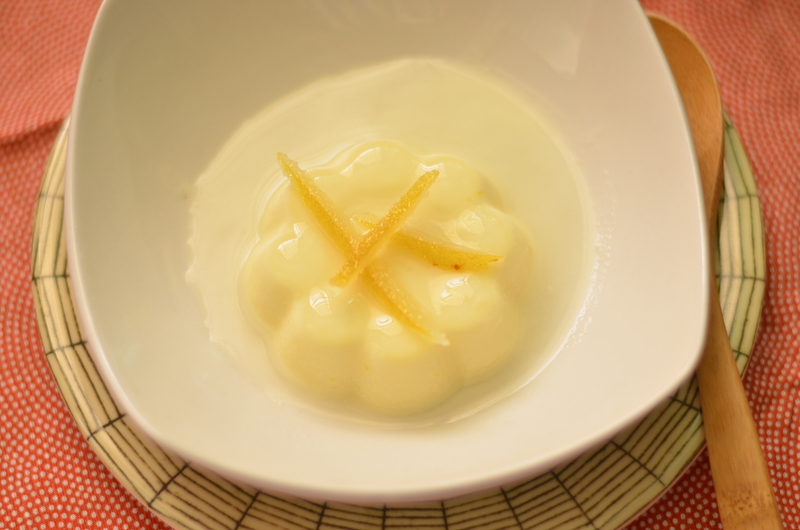 Oh Jo, I adore panna cotta… so I’m sure I’d love your yuzu version! It’s such a versatile dessert for infusing with other flavours. Looks wonderful! What a beautiful flavor you’ve chosen for your panna cotta. You’ve photographed it so well and the candied citrus peel is a nice, finishing touch.